The group opened last week and we’ve had a great weekend destashing some of our own work and running lots of launch giveaways (these are still going on too) so if you haven’t joined us yet do pop by and take a look. Now comes the harder part for me – thinning out my purchased bead stash. I have spent a small fortune on beads over the years – especially art beads but the realisation has dawned that I’m never going to use a lot of them for a number of reasons. They are all beautiful but since I began collecting my tastes and design style have change and a lot of them don’t ‘fit’ anymore. Because I now make my own beads I find I use less and less bought beads since I want to make my designs as much my own as I can. I will always use other peoples beads (and no doubt continue to buy them) but more as accents than features. The last point is that I doubt I will even live long enough to use all the beads in my stash! It seems a real shame that so many lovely beads are hidden away in boxes so I’ve decided it’s time to start letting go and hope that someone else can enjoy them and hence my house is currently full of baskets and trays I’m working through. This is not an easy thing to do and I always worry that I’m going to offend makers by selling on their work but it really is just a practical move. Anyway, If you like a bargain I will start listing things this week at at least a 30% discount. 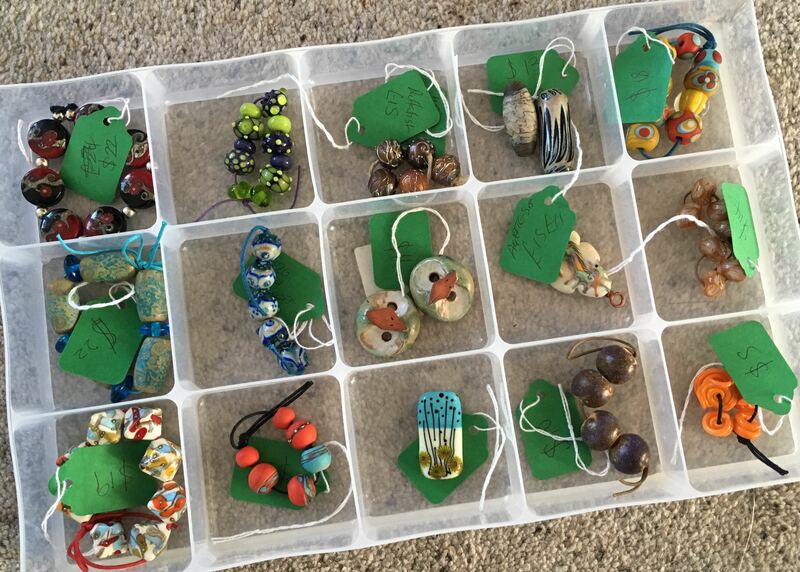 It will be a slow process as I have to go back and check prices and since some of these beads were bought before I ran a business the paperwork is a little sketchy in places – but then that does mean there’ll always be something to look forward to. Other members of the Art Elements team will be doing something similar and not just with beads…there could be any number of art and craft supplies, books…who knows what. To keep an eye on what’s available just join us at Art Elements Extra – you might just fins some treasure. I just have to resist undoing all the good by shopping there myself!